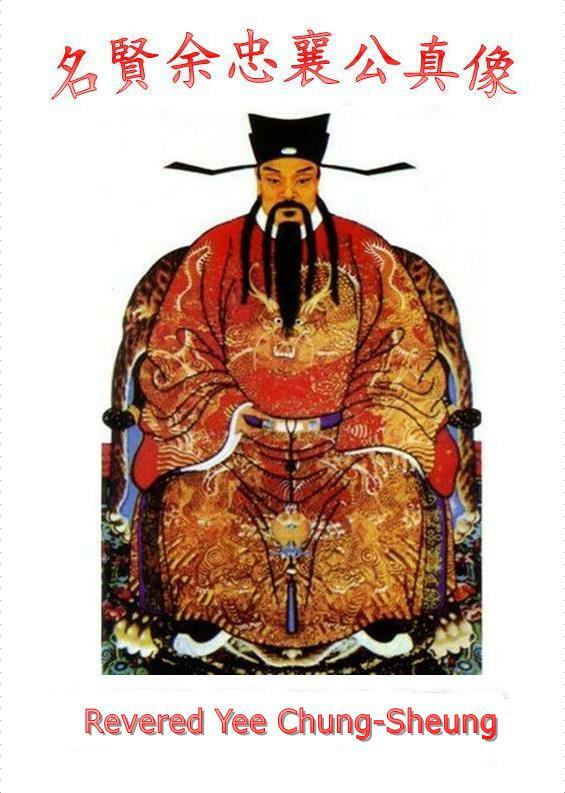 The first ancestor of Yee Clan is the Revered Yee Chung-Sheung, a prominent personage of the North Sung Dynasty, named Jing as a child, On-Doh when grown up, and Moo-Kai as a form of address. Fung Toy (elegant demeanor), a beautiful name, originated from a congratulatory line of poetry by his contemporary Choy Sheung: " Surely your strategies benefit the Emperor's reign, and your elegant demeanor uplifts spirits of court ministers." Yee clansmen immigrated into the U.S. years ago. In 1886 (the 21st year of Gwang-shui Emperor, Ching Dynasty), early clansmen organized the Sheung-Shin Hall Hundred Person Association, to cherish memory of ancestral virtues and promote clansmen relations. Funds were collected to purchase the property at 131 Waverly Place in Chinatown of San Francisco, to establish the Yee Family Association, whereby clansmen could offer ancestral sacrifice and enjoy family happiness, The April -1906 S.F. earthquake burned down the property. In winter of the same year, clansmen reorganized the association under the name Sheung-yik Hall Hundred-Person Association. They reconstructed the Fung Toy House, which exists as the four-story building as seen today, with the name Yee Fung Toy Moo-kai Headquarters. The building went through a renovation in 1958. A resolution was also passed at a general meeting to adopt the standard name the U.S. Yee Fung Toy Headquarters there after. Apart from the Headquarters, 13 branches have been established in New York, Sacramento, Detroit, Boston, Southern California, Chicago, Phoenix, Seattle, Cleveland, Salt Lake City, Houston, Stockton and Columbus respectively. Branches conduct clan affairs and connect members within areas of jurisdiction. The Yee clansmen in the U.S. number over 10,000, which includes, registered or not, new and old immigrants, the U.S. born, both genders old and young. Yee Fung Toy Headquarters' purpose is to make friendly contacts among clansmen, work for their well-being by pooling wisdom and uniting forces, advance clan affairs, and support public welfare. All U.S. branches meet every three years at a general meeting, to discuss reform, revise the constitution, and elect the grand president. This general meeting is Yee Fung Toy's highest organization. The Headquarters conducts myriad clan affairs: Spring events -- New Year's Eve Reunion, New Year Opening, Offering Ancestral Sacrifice, Spring Banquet; other yearly events -- Dragon Boat Festival, Mid-autumn Festival, Winter Solstice Party; other meaningful activities --Ching-ming and Chung-yang tributes to ancestors' tombs, the fall outing party, Christmas gifts for children, winter visit to elderly clansmen in nursing homes. Clansmen participate well. As to overseas Chinese public welfare and charitable causes, we always try our best. Since 1958, the Headquarters has established a scholarship fund to award clan juniors with excellent academic performance and encourage them toward goals to benefit the multitude. This educational undertaking of decades wins loud applause from the overseas Chinese sector. In 1996, the U.S.-Five Tong Associations Liaison Committee got the Hong Kong Five Tongs to agree to a one-time appropriation of US $1,000,000 for establishing the Hong Kong Five Tong Associations Scholarship Foundation in the U.S. Annually, $35,000 of the interest earned will be set aside to continue the U.S. Five Tong Associations Scholarship Program. Of this $35,000, $3,500 is to go to the Canada Yee Fung Toy Headquarters for scholarship awards throughout Canada. Also, as of 2004, on a yearly basis, Yee Fung Toy Headquarters allocates US $4,000 from the Moo-kai Education and Welfare Funds, for scholarships to distribute to Yee clan juniors back in the native village, four middle schools, through the help of Hong Kong Yee Family Associations. This is to implement the equitable ideal that we care about all Yee juniors, inland or overseas.